"We are OPEN on all Federal Holidays except Christmas and Thanksgiving." Please note: I cannot recommend visiting SF-88 until the park tunnel is cleared and access less painful !! (Please note: the telephone answering machine also says "closed when raining". 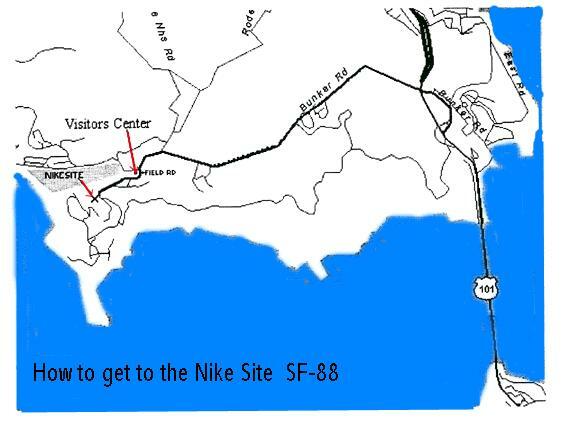 Nike Site SF-88L is just north of San Francisco, CA. You may visit this site! It is in the Golden Gate National Recreation Area on the Marin Headlands, just across the Golden Gate Bridge. This is part of the National Park Service - Department of the Interior. The site was restored to about its present condition by over 20 volunteers during the years 1990 through 2000. This included trips to Pennsylvania and China Lake Naval Weapons Station for equipment and spares. Many of those volunteers are now in the Nike Historical Society. Many of those volunteers helped setup and contributed to the SF-88 Museum now removed. One veteran said "It is sterile and austere." Click on map to expand, "back" to return here. The descriptions courtesy Bud Halsey. "From the south: Traveling north on route 101, after crossing the Golden Gate Bridge, take the Alexander Avenue exit then turn right. Travel approximately 100 yards then take the first left which is Bunker Road. Continue for about 200 yards to the tunnel. After exiting the tunnel continue west on Bunker Road for approximately 2.5 miles. You will reach a fork in the road. Veer to the left. About 150 yards after the fork you will see the Park Visitors Center on you right. 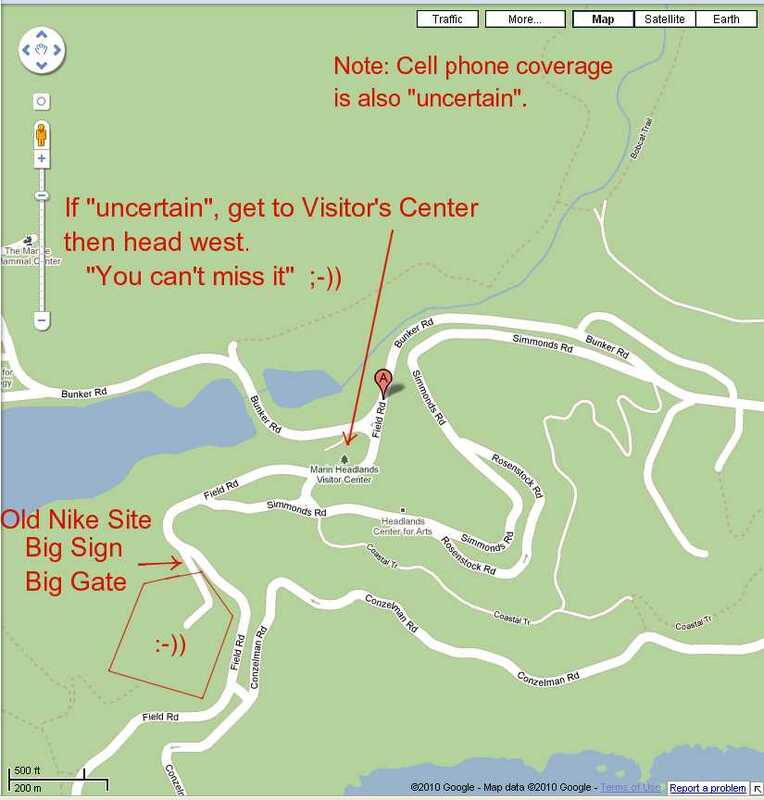 Site SF-88L will be the first right you come to beyond the Visitors Center. From the north: Traveling south on route 101, take the last exit (Sausalito) before the Golden Gate Bridge. Turn right onto the frontage road then proceed under the freeway approximately 200 yards then take the first left which is Bunker Road. Continue for about 200 yards to the tunnel. After exiting the tunnel continue west on Bunker Road for approximately 2.5 miles. You will reach a fork in the road. Veer to the left. About 150 yards after the fork you will see the Park Visitors Center on you right. 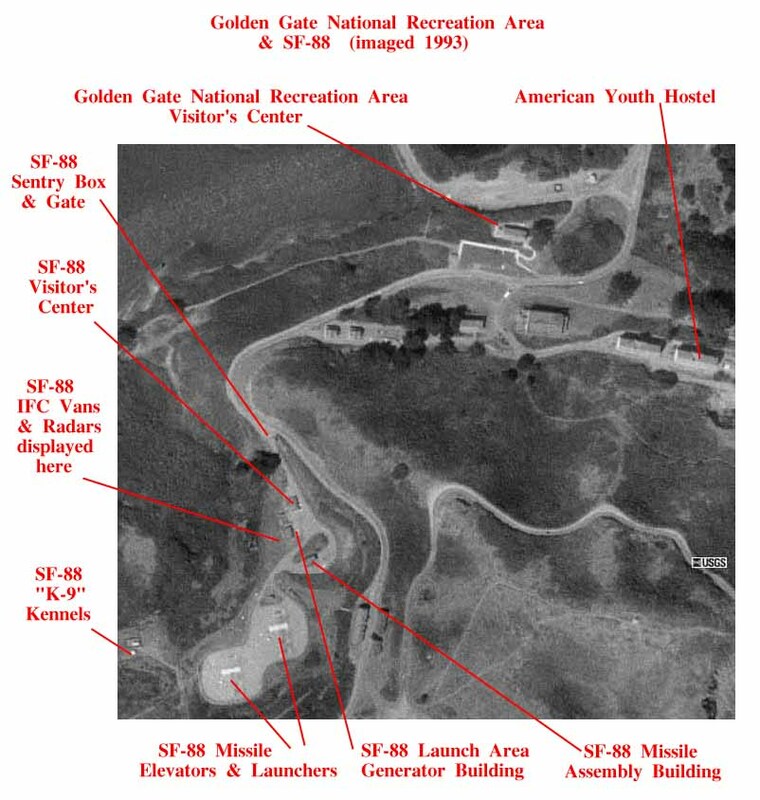 Site SF-88L will be the first right you come to beyond the Visitors Center." "The visiting hours at the Nike Site are: as per Aug 4, 2018, for latest days and hours see NPS site. Note: Arrangements can be made for special tours (school groups, etc.) for other times. Call (415) 331-1453. 1 These units would have been on Wolf Ridge, about 5,000 feet to the NorthWest. (Radar likes to be high to see far ;-)) These units are located here in the launcher area for convenience, and because part of the road up to Wolf Ridge has slid down the hill. Alternative housing: For those wishing a different experience, or to save bucks, there is a Youth Hostel about 300 meters away. and earmarked "Nike Site" and sent to the above address.